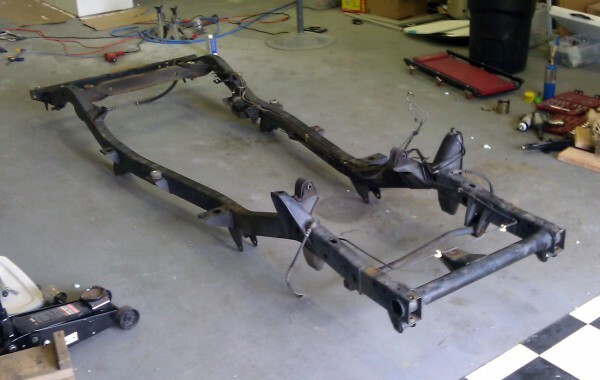 Jeep #12: Frame has arrived! We just picked up this Jeep frame from a local guy. It is virtually rust free. There are a few spot of surface rust that will be easy to take care of, but this frame will be a great start. We’re gonna clean it up, install the new lift kit and suspension and then start swapping parts over from our Jeep! That might not happen for a few months, but we’ll be collecting parts and doing little things to prepare in the meantime. Great job on #18, I’m looking forward to #12 side-by-side! My lady is a wrangler fan, and I a Geo Tracker fan. I’ve played with the idea of getting a red Geo and doing a jurassic cross-over with it! But then again, the more I look at your blog, the more I am attracted to the idea of doing exactly what you’re doing! Really enjoying the updates, looking forward to the next one. Also, just read more in the about–that there are two of you building jurassic jeeps. Updates?!?! I’m about to start my Jurassic Jeep Journey. If you can swing it, go for old man emu on the suspension. Probably my favorite mod on my Jeep. What is an old man emu suspension?